It is just bare desert, and is strictly unofficial (read that as "at your own risk"). You might want to try to join the people flying there on Friday mornings (6am to 8am), at least the first time. Obviously, you cannot expect people in the middle of a desert during any time on any given day. There are others who fly during the afternoons (especially during the weekends), but it is not regular. You have to hook up with someone and decide on a time, otherwise you will find yourself alone there. Finally! Made it out to the Wakrah field with Ghettoflyer. Wasn't too difficult to find. 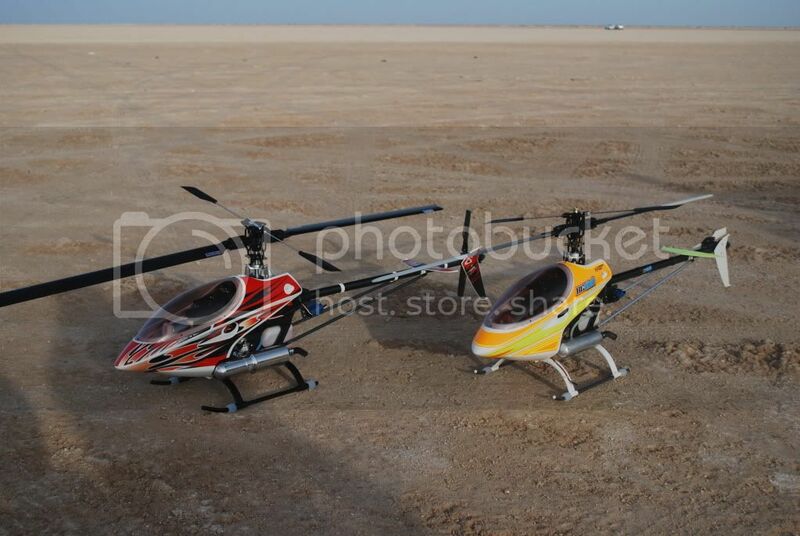 There was a small group of plane fliers having fun in the wind, Ghettoflyer got a quick flight in on his Raptor 50. I went to start my Raptor 50 for the first time and induced a hydro lock in the engine and popped the cooling fan loose, there's always next weekend. Here's a quick pic of the machines at the field. Very nice canopy Did you made this? Interested in having the same beautiful canopy. that is a sticker set for the Raptor 50 from "Upgrade R/C", I ordered it from amainhobbies. They have a blue set that has the same pattern as the red set, you may consider that one to be unique. Thanks Ron for your reply. The latest update from the Qatar Scientific Club is that an official field will be approved in the Wakra region soon. is this flying field still active? Will anyone be down there Friday morning? Is it still in the same location? Thanks Anwar point taken i will search before posting. I was worried that the activity oj this site is relitvly low so i wsnt sure how uptodate it was. See you tomorrow if i can find the place that is! I will definatley be in Wakrah again tomorrow at 3pm!! Saf_rcpilot - Sorry I missed your post in this thread, I was out of town at this time, and was not checking the site. Good that you have located the place. In summary, yes people are going there on Friday mornings and Saturday afternoons. If this changes, I will try to post it here. I have also made the directions more up-to-date (especially about that "emergency vehicle only" U-turn which seems to confuse everyone) !